If you use Twitter and like to share the occasional wine or tasting note with your followers, CellarTracker can help you tweet what you are buying, drinking or tasting. Posting to Twitter can be easily suppressed with simple checkboxes during the aforementioned actions on CellarTracker. To enable posting to Facebook, you must first link your accounts together. Go to the CellarTracker My Subscriptions page, and scroll to the bottom to find Twitter Click Sign Up. 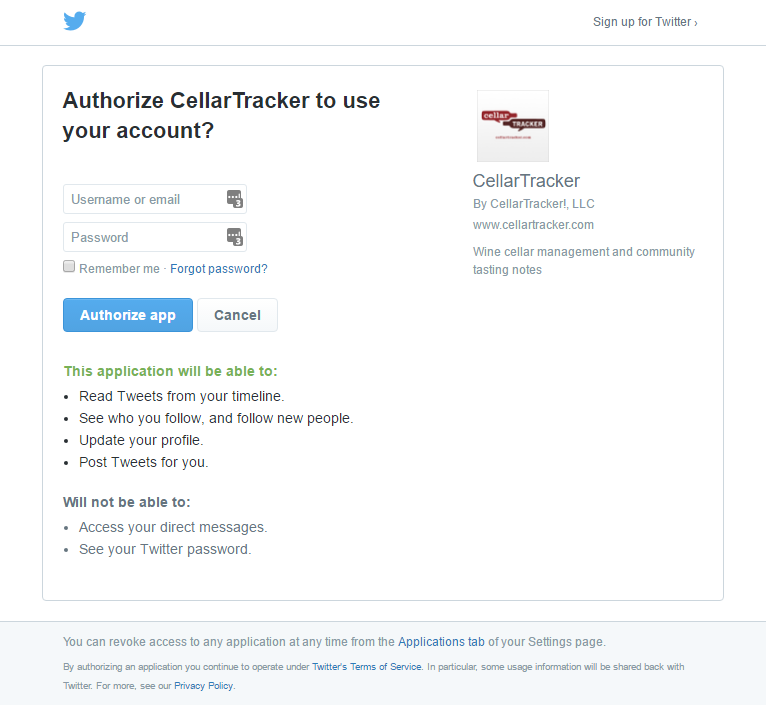 A dialog will open up asking you to log in to Twitter (if you are not already logged in), and to authorize the CellarTracker app. Press Authorize app to enable the integration. If everything worked, CellarTracker will now refresh and indicate that your accounts are successfully linked. There are two ways that you can un-link your Facebook account from your CellarTracker account. On the My Subscriptions page, click the Remove link below Twitter. This will remove your cached credentials from CellarTracker. From within Twitter, go to Settings, then Apps, and select CellarTracker in the list. Click Revoke access to remove the authorization.